Insulin is a hormone produced in the pancreas which helps to regulate glucose levels in the body. Medically, it is typically used in the treatment of diabetes. Recently, insulin has become quite popular among bodybuilders due to the anabolic effect it can offer. With well-timed injections, insulin will help to bring glycogen and other nutrients to the muscles. 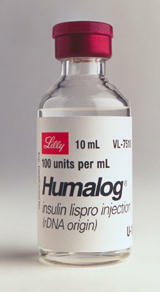 In America, regular human insulin is available without a prescription by the name of Humulin R by Eli Lilly and Company. It costs about $20 for a 10 ml vial with a strength of 100 IU per ml. Eli Lilly and Company also produces 5 other insulin formulations, but none of these should be used by bodybuilders. Humulin R is the safest because it takes effect quickly and has the shortest duration of activity. The other insulin formulations remain active for a longer time period and can put the user in an unexpected state of hypoglycemia. Hypoglycemia occurs when blood glucose levels are too low.. It is a common and potentially fatal reaction experienced by insulin users. Before an athlete begins taking insulin, it is critical that he understands the warning signs and symptoms of hypoglycemia. The following is a list of symptoms which may indicate a mild to moderate hypoglycemia: hunger, drowsiness, blurred vision, depressive mood, dizziness, sweating, palpitation, tremor, restlessness, tingling in the hands, feet, lips, or tongue, lightheadedness, inability to concentrate, headache, sleep disturbances, anxiety, slurred speech, irritability, abnormal behavior, unsteady movement, and personality changes. If any of these warning signs should occur, an athlete should immediately consume a food or drink containing sugar such as a candy bar or carbohydrate drink. This will treat a mild to moderate hypoglycemia and prevent a severe state of hypoglycemia. Severe hypoglycemia is a serious condition that may require medical attention. Symptoms include disorientation, seizure, unconsciousness, and death. Insulin is used in a wide variety of ways. Most athletes choose to use it immediately after a workout. Dosages used are usually 1 IU per 10-20 pounds of lean bodyweight. First-time users should start at a low dosage and gradually work up. For example, first begin with 2 IU and then increase the dosage by 1 IU every consecutive workout. This will allow the athlete to safely determine a dosage. Insulin dosages can vary significantly among athletes and are dependent upon insulin sensitivity and the use of other drugs. Athletes using growth hormone and thyroid will have higher insulin requirements, and therefore, will be able to handle higher dosages. Humilin R should be injected subcutaneously only with a U-100 insulin syringe. Insulin syringes are available without a prescription in many states. If the athlete can not purchase the syringes at a pharmacy, he can mail order them or buy them on the black market. Using a syringe other than a U-100 is dangerous since it will be difficult to measure out the correct dosage. 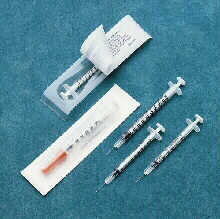 Subcutaneous insulin injections are usually given by pinching a fold of skin in the abdomen area. To speed up the effect of the insulin, many athletes will inject their dose into the thigh or triceps. Most athletes will bring their insulin with them to the gym. Insulin should be refrigerated, but it is all right to keep it in a gym bag as long as it is kept away from excessive heat. Immediately after a workout, the athlete will inject his dosage of insulin. Within the next fifteen minutes, he should have a carbohydrate drink such as Ultra Fuel by Twinlab. The athlete should consume at least 10 grams of carbohydrates for every 1 IU of insulin injected. Most athletes will also take creatine monohydrate with their carbohydrate drink since the insulin will help to force the creatine into the muscles. An hour or so after injecting insulin, most athletes will eat a meal or consume a protein shake. The carbohydrate drink and meal/protein shake are necessary. Without them, blood sugar levels will drop dangerously low and the athlete will most likely go into a state of hypoglycemia. Many athletes will get sleepy after injecting insulin. This may be a symptom of hypoglycemia, and an athlete should probably consume more carbohydrates. Avoid the temptation to go to bed since the insulin may take its peak effect during sleep and significantly drop glucose levels. Being unaware of the warning signs during his slumber, the athlete is at a high risk of going into a state of severe hypoglycemia without anyone realizing it. Humulin R usually remains active for only 4 hours with a peak at about two hours after injecting. An athlete would be wise to stay up for the 4 hours after injecting. Rather than waiting to the end of a workout, many athletes prefer to inject their insulin dosage 30 minutes before their training session is over and then consume a carbohydrate drink immediately following the workout. This will make the insulin more efficient at bringing glycogen to the muscles, but it will also increase the danger of hypoglycemia. Some athletes will even inject a few IUs before lifting to improve their pump. This practice is extremely risky and best left to athletes with experience using insulin. Finally, some athletes like to inject insulin upon waking in the morning. After the injection, they will consume a carbohydrate drink and then have breakfast within the next hour. Some athletes find this application of insulin very beneficial for putting on mass, while others will tend to put on excess fat using insulin in this way. Insulin use can not be detected during a drug test. For this reason, along with the fact that it is cheap and readily available, insulin has become a popular drug among the competitive athlete. However, before an athlete attempts to use insulin, he should educate himself and make himself aware of the consequences. Order Insulin and other anabolic hormone drugs by mail order!